Hello world, Dee here how is every one? Hope all the fathers had a wonderful Father’s Day? On the weekend, the family and I watched a movie called “Life of the Party” starring Melissa McCarthy. I’m a fan of hers, I think she’s hilarious I’ve watched a lot of her movies and shows, she makes me laugh and I love her wittiness. 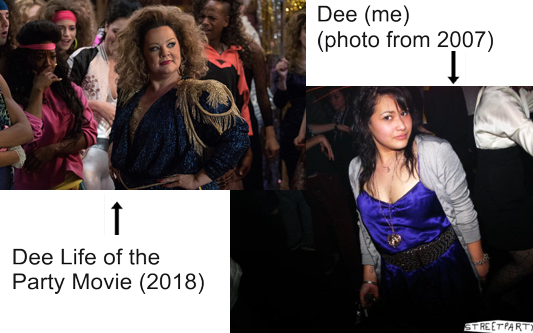 “Life of the Party” is the first movie I have ever seen that had a character with my actual first name – spelled exactly the same way! (“Deanna”) I was shocked, and her father’s name was Michael too, and her friends in the movie were calling her “Dee Dee” and “Dee” too! I was cheering out loud whilst watching the movie, it was amazing some of the similarities I had to Melissa McCarthy’s character’s personality…and of course my little treasure was shaking his head at me hahaha! Without giving too much away (incase you watch the movie), it is about a freshly divorced mother who goes back to College/University, which is the same one as her daughter. All sorts of hilarious things happen, you feel for her, you laugh with her, you get angry with her and you support her. In the end, Deanna runs out of financials to stay at University, but her daughter and friends decide to help by running a fundraiser/party to save her. Deanna is a stand out and a rare little lady; she gained respect and adoration of anyone around her just by being herself, and she is the life of the parties. I thought it was fantastic the support and encouragement her new-found friends and family provided. Yes, this always comes hand in hand with friendship, however by the end of it all – even her adversaries end up helping; just by being at the party. Thought this was funny because I have a photo taken a few years ago that’s similar to one from the movie! In life you will always come across hurdles and challenges in your path, it is what you do with them and how you get through them that makes you a success in your own right. If you have a strong support network, I believe you can get through any obstacle or difficulty thrown your way. Industry support, product support and technology support also relate to this. I read on the “SAM” (Support Australian Manufacturing) website the other day “Australian Manufacturing is NOT dead. Manufacturing has simply evolved…” I like how they’ve worded this and I agree. Manufacturing has definitely evolved, I mean you can take our Factory/Facility as a perfect example. As you can see, over time, Manufacturing started as a ‘manual’ growth, then incorporated CAD/CAM and has now evolved by integrating Additive Manufacturing printers. Don’t get me wrong, manual work is definitely still utilized, even when using new technology of Metal 3D Printers – for post processing. When polishing and cleaning up of product; this is still personally handled and operates physical effort. The saying “elbow grease” works well with the Metal Additive Manufacturing industry. This is why a customer and end user should still be able to appreciate a Metal 3D printed part as it is an impressive feat to get to the end product and result. 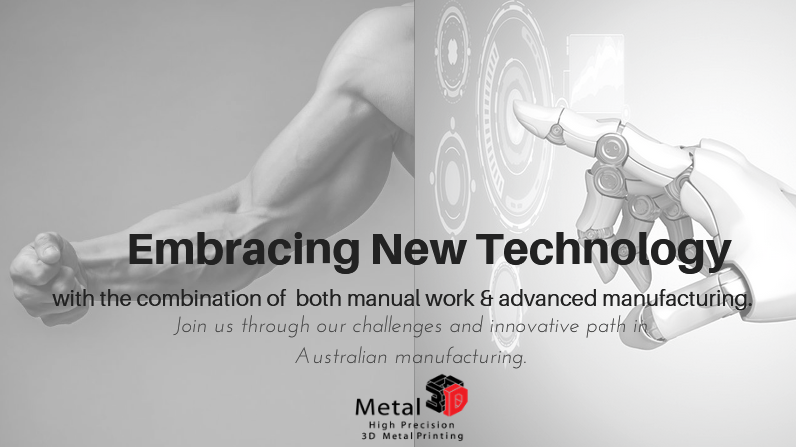 When Supporting Australian Manufacturing, it’s not only the ‘old school’ hammer and nail manufacturing, it definitely also embraces new technology of Metal Additive Manufacturing (Metal 3D Printing). So, the next time you need something made, whether it be a new light weight part for your race car or motorbike, a custom medical part for your patient, or unique wearable tech; instead of going overseas, contact your local company that appreciates helping others and reinforces technology with Australian manufacturing. Support Amiga Engineering through its journey of new challenges and innovative path.